Marriage can be difficult sometimes. Some people choose to get a divorce and others try to repair their marriage. Either way, you should consider if a separation is right for you during this time. Separating can be beneficial. It gives each spouse space and time to think and decide what to do. Whatever your reasons for choosing a separation, it can be a strain financially. The experts at Blisk Financial have put together a list of Dos and Don’ts for couple in a separation to follow. If your spouse has been handling the finances alone, you will be clueless about the marital finances if you separate. You will not know how much your spouse earns, what they are spending or investing. This is a dangerous situation. Having good credit gives you a firm foundation for a secure financial future. If you don’t have one, get a credit card in your own name. You can be held responsible for debt that your spouse accrues during a separation if there is no legal document to specify otherwise. To avoid this, pay off these debts and close the accounts as soon as possible. The agreement can also serve other purposes. You may be mindful of the timing of a divorce or have religious reasons preventing a divorce. A separation may be the means to work on a marriage and repair things or it may be the first step to divorce. Even if you want to reconcile the marriage, your partner may choose not to. you need to be prepared for either. Here are a few Don’ts to remember during your separation. Exercise discretion and only discuss it with necessary parties. It is tempting. You may want to treat yourself but don’t. Overspending can lead to you being accused of dissipating assets if the separation leads to a divorce. A new relationship while you are still legally married will not benefit you at all during divorce negotiations and settlements. Finally, don’t get complacent. If it is clear that the marriage is over, proceed with a divorce. Don’t just stay separated. 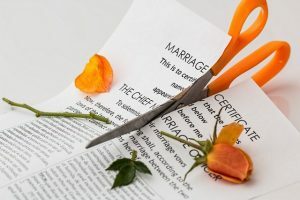 A divorce means moving on with life. Make it legal and move forward with your life. If you are considering separation or divorce, contact Blisk Financial Group and let our team help you.